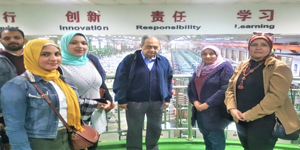 A delegation of the Petrochemical Engineering Department organized a field trip to Jushi Egypt Company for Fiberglass Industry on Monday 8/4/2019 for the fourth and fifth year students. The coordination of the visit was managed by Prof. Ehssan Nassef, Prof. Riham Hazzaa, Prof. Rania Farouq, Prof. Abbas Anwar and Eng. Mohamed Hawary. The delegation was introduced to the units and different production processes. The company engineers praised the students for their knowledge of the basics of the fiberglass industry; an aspect that could entitle them to find training as well as job opportunities in the company. On another level, the company administration and the PUA staff reached an agreement on a cooperation protocol allowing the students and graduates to receive training at the company. The company will provide opportunities of three-month summer training including accommodation and transportation from and to the company. At the end of this trip, the company senior administrative staff were invited to a job fair that will be held on Tuesday 23/4/2019 in the Faculty of Engineering at PUA.